Toothpaste, It’s Not Just for Brushing Teeth! Of course, we hope that you use your toothpaste to brush your teeth at least twice a day as part of your general dental care. We bet you didn’t know that toothpaste can be used for much more than simply brushing your teeth! If you have a tube of toothpaste laying around, perhaps a partially used tube that you didn’t taste great or work like you had hope, here are some ideas to try, rather than throwing it away. You know that toothpaste cleans your teeth, but it also has other cleaning capabilities including removing stains from clothing and carpets. If you have a stain on your favorite shirt simply rub a bit of toothpaste on the stain and rub until gone. Wash garment as the tag suggests. If you have a carpet stain, rub toothpaste into the stain with an abrasive brush and rinse immediately. You can put toothpaste on a minor burn to help alleviate the pain and get some relief. 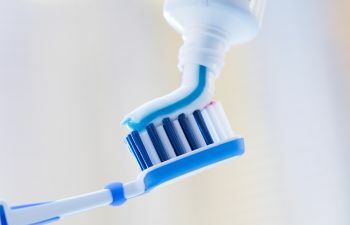 Toothpaste will help reduce the irritation from bug bites and blisters. If you struggle with acne or zits, try placing a small amount of toothpaste a trouble spot at night while you sleep. Wash off in the morning and many times the blemish will decrease in size. Toothpaste can turn dull, dirty fingernails into shiny beauties. Try brushing your fingernails with a soft toothbrush and toothpaste and see how they dazzle. When you run out of hair gel, gel toothpaste can be used as a substitute to fix your do just the way you want to! Are you having trouble getting a stinky smell from cooking with fish, garlic or onions off your hands? Wash your hands and fingers with toothpaste and simply wash the stinky smell away! Do you have dirty sneakers or running shoes? Rubbing toothpaste on your dirty shoe soles using a stiff brush will clean away the dirt and stains. Simply wipe the toothpaste away to have your shoes look like new. A warm damp washcloth with a little toothpaste can wipe crayons off of a painted wall! Toothpaste is a great cleaning for silver jewelry! Be sure to use a soft bristled brush or cotton cloth when cleaning silver jewelry. Toothpaste also makes diamonds sparkle! You can clean your piano keys with a damp lint free cloth and a little toothpaste. Toothpaste will help remove the oil from your skin that gets on the keys and attracts dirt. You can use toothpaste to remove the burnt crust that builds up on clothes irons. Gently rubbing a little toothpaste on swimming goggles and rinsing off will prevent your goggles from fogging up! We hope you enjoy all of these fun and practical uses for toothpaste! Now go brush your teeth.